Using Icinga2 to monitor your infrastructure is great. Here is my second edition of the script that enables your Icinga to alert you using the Pushover service. 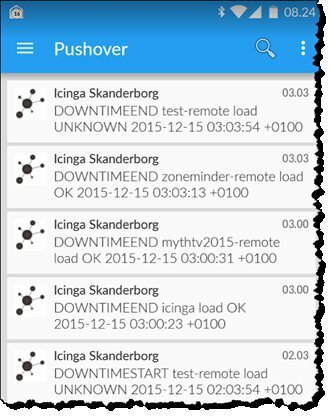 A while back I wrote about Pushover notification with Icinga 2. I have recently been helping an Icinga administrator who was not getting his Pushover alerts. This had led to the second edition. What is new is that the notify_by_pushover2 script now checks if Pushover accepted the message, and if it did not it logs the response and exits with a failure that will be readable in the icinga2 log file. The icinga2 log file is in /var/log/icinga2/icinga2.log on my system. I will repeat the instructions here, except the Pushover-script is changed. Here is the quick guide to making your Icinga 2 do notifications using the Pushover service. You need to create one file - notify_by_pushover2.sh in my example. Permissions on that file need to be like the existing files in the same folder. My script is based on what i learnt from the script found in Using Pushover to push Nagios notifications. You need to edit four files: commands.conf, templates.conf, notifications.conf and users.conf. This is assuming the out of the box default configuration files are used. The text that i show in my examples below is text that you should add to the existing configuration files, you should not replace the existing text in those files. In my example notifications.conf i use some "assign where" that relate to mail. I know this could be done in a more clean way. PUSHOVERMESSAGE = "$notification.type$ $host.display_name$ $host.state$ $icinga.long_date_time$"
PUSHOVERMESSAGE = "$notification.type$ $host.display_name$ $service.display_name$ $service.state$ $icinga.long_date_time$"
display_name = "Icinga 2 Admin"
vars.pushover_user = "YOUR PUSHOVER USER TOKEN HERE"
vars.pushover_token = "YOUR PUSHOVER APPLICATION TOKEN HERE"